I think we can safely agree now that Intel cpus bellow $300 for gaming = no no. again for the AMD fans, wouldn't be better to just buy the FX 6100 (since power usage is not a great concern anyway...)? 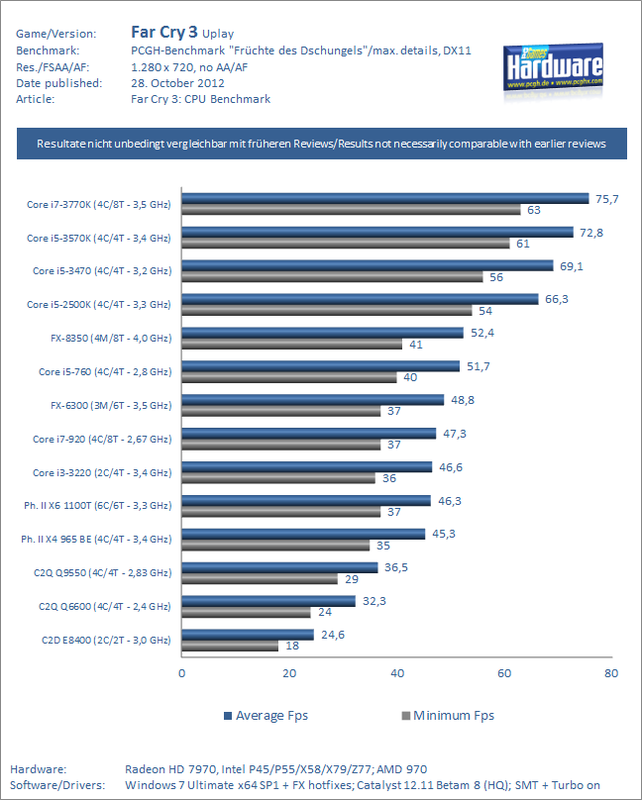 at the same clock it should be as fast as the a10 for gaming, the A10 had some improvements, but it lacks the l3 cache (and comparing the 5800K with the FX 4300 it makes a big difference for gaming http://www.anandtech.com/bench/Product/675?vs=700), but the 6100 have also 3 modules, cpu clock is low, but it shouldn't be hard to OC it to 4GHz? In your test the resolution is much lower(12x7 Vs 19x10). What AtenRa linked was high resolution gaming ,what one with high end hardware will use(and not low resolution). FX delivering < 60 fps at low resolution, will still deliver < 60 fps at high resolution. It's not magicaly going to get better. And the worst part is, with GPU bottlenecks you can just set on or two setting sfrom "ultra" to "high" with minimal cost in quality to ensure enjoyable gaming experience (60 fps). With the FX you are stuck with 40 fps no matter what. GPU limited even at 1280x1024 with a 4 year old Nehalem at 3.75GHz and GTX680. Every FarCry 3 review have produced different results so far because they bench with different hardware(GPUs) and different IQ settings. With the FX however you are not, since it delivered 10 frames less. It's a bit embarassing that a 200$ 8core cpu launched a month ago, is 10-15% behind a 4 year old cpu. 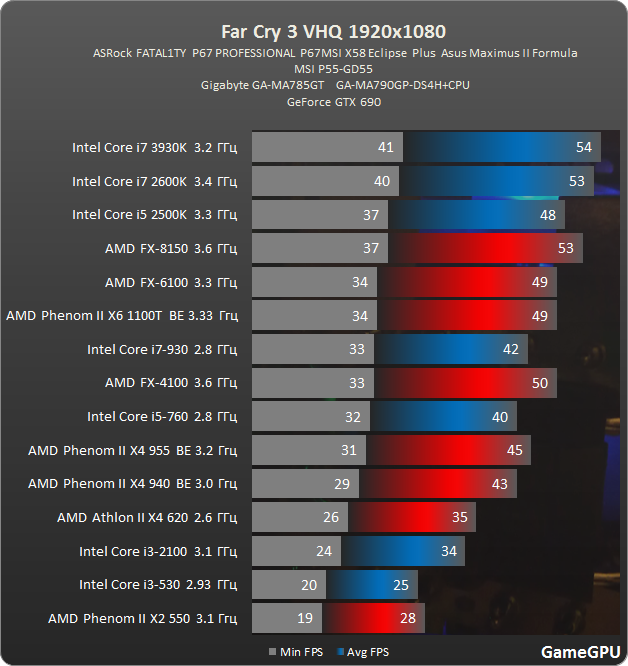 Well, if you look at the graph SPBHM posted, the FX 8350 = i5 760 in Far Cry 3, so even with the i7 965 at stock it would probably still be 10 frames ahead. Anyways, it's a classic example of todays games, where IPC > Core count. To me, one concern with suggesting Trinity is that his RAM clocked at 1333Mhz. IF the APU's sensitivity to RAM clockspeeds applies here--it might not since he is using a discrete card; this would be a moot point in that case--, what would be the implications of it for him? increase the resolution and the framerate is not going to increase, it will only decrease or stay the same, it's a valid test, it shows the CPU limiting the performance. 4 years ago nehalem was by far the best CPU around, so "a 4 year old cpu" being the i7 at 3.7GHz hardly means that the game works fine with any CPU.